Hard cider seems to be popping up everywhere these days. It started in the dark, dusty corner of the local beer and soda store. Then local brands like Doc’s in Warwick started to pop up in grocery stores. Then came the wave of commercial brands beginning with Angry Orchard, owned by Samuel Adams parent company, Boston Beer, Strongbow, owned by Heineken, and Stella Artois Cidre owned by Anheuser-Busch InBev. Then new, craft cideries began to dot our landscape and seep into the corners of our stores. And the hard cider revolution had begun. Hard cider is apple cider that has been fermented and has an alcoholic content, typically from as low as 2% to as high as 11% by volume, but averaging around 6% alcohol by volume. And while typical commercial versions tend to be sweet, there are a myriad of ciders available that can be described as dry, tannic, farmhouse, hopped, barrel-aged or sour. They can be made from common apples, known as dessert or baking apples, to specialty apples used only for fermenting. Dessert apples, which are the typical varieties that are found in the supermarket and eaten raw, can give a sweet “apple juice” flavor to products, but cider apples, of which there are hundreds of varieties, can give cider many different characteristics. Hard cider has quite a history. It is said such historical figures as Sir Issac Newton, John Adams and Thomas Jefferson drank cider. In the US, apples were cultivated in what is now Boston as early as the 1620’s by William Blackstone (or Blaxton) and hard cider played a pivotal role in the early rural economy. Since apple trees, once established, yielded large harvests, pressing and fermenting was an easy way to preserve the juice. In addition, cider was the basis for other products like apple jack, apple brandy and vinegar, which was then used to preserve other foods. Hard cider was the preferred drink of the earliest Americans as water was often polluted near settlements. Ale was expensive to import from England, a process that was likely complicated by the political climate at the time. Since apples grew so well, particularly in New England, by 1775 one in every ten farms were operating a cider mill in the region. The commonality and usefulness of the product made it a unit of exchange instead of money at the time. Hard cider began losing its allure by the height of the industrial revolution, as the population shifted from rural farms to larger cities. Factors like weather and movements like prohibition almost wiped hard cider from our culture, with the exception of some hard-core enthusiasts. Today, with the rise of gluten-free diets and craft brewers and distillers, cider is enjoying a resurgence in popularity. More and more commercial brands are popping up as the cider market share slowly begins to erode the beer market. Cider is now made in almost every state in America, even if the apples are sourced from elsewhere, and it is enjoyed equally by both men and women. With growing popularity, comes some consumer confusion. While most consumers see cider in their supermarkets, beer store and local liquor store, there is often little guidance about what is actually in the bottles. And like craft beer, there are many different styles. To understand how there are different styles coming from apples, which are often thought as high in sugar content, compare the fermentation process to grapes. Also considered a sweet fruit, grapes can produce a myriad of different types of flavors, from crisp and clean, to buttery and oaky, to savory to dry. While there are a few styles of wine that taste just like grape juice, there are thousands of types that simply do not. Hard cider is similar in that respect. Fermentation in both grapes and apples, turns sugar into alcohol. A cider maker can choose to ferment their apples to zero residual sugar, producing what would be perceived as a dry finish. The addition of things like juice, sugar or other flavors can then change that to the cider maker’s taste. Length and vessel in ageing, types of yeast, how and where apples are grown, varieties of apples used and many other factors contribute to the final flavor of a cider. Hard cider has many appealing features beyond the variety of styles. It tends to be lower in alcohol, like a beer, without the grainy bitterness or hoppy flavor profile. Some are dry and complex and can be paired like a wine with many different styles of food, making it a versatile option in a myriad of social situations. Different sized grab-and-go packaging, from single serve 12 oz bottles and cans, to sharable 750ml bottles, offer consumers options appropriate for various occasions. Growlers offer consumers yet another way to purchase product. Filled from a tap or draft system, growlers are typically 16, 32 or 64 oz glass, metal or plastic jugs that are designed to house products with some sort of carbonation. This reusable container is often considered the freshest option by many cider enthusiasts, and fills are offered by some cideries, restaurants and select retail establishments. Hard cider on draft is housed in “kegs” which are plastic or metal drums that hold between 20 liters and 15.5 gallons of product which is then drawn from a refrigerated area through the tap system. The product is often tasted and therefore chosen more frequently, creating a faster turnover than it’s bottled and canned counterparts. Time, turnover and temperature control yields less opportunity for oxidation, which, in turn, can give a fresher flavor. To determine the general sweetness and flavor profile of a cider, first look at the bottle. Many cider makers have begun to add a scale so consumers can make choices that fit their flavor profile. Package size can also be helpful. Smaller packages, like cans and 12 oz bottles are often marketed toward relaxing or recreational occasions, where lower alcohol, straight forward, softer, sweeter or fruit forward flavor profiles are desired. Alcohol content can also be an indicator. Higher alcohol content, between 7-11%, can mean drier cider, as that can be an indicator that the cider has been more fully fermented. However, additions after the process, like adding in unfermented juice, can change that. A very low alcohol content, like 2-5% might indicate the opposite. You might see words like “keeved” cider on labels, particularly from areas like France and England. This is an artisan method that stops the fermentation process before all the sugar is consumed by the yeast. Therefore ciders like these will have some sweetness from the residual sugar, but typically more complexity and density than their commercial counterparts. Keeved cider originates in the Normandy and Brittany regions of France and tend to have a rich apple flavor, a ton of complexity and a touch of sweetness, making it pair well with foods like blue cheese, crepes and pork, as well as on it’s own. This lower alcohol style is often seen in large format bottles, like 750ml, topped with what looks like a Champagne cork and cage. This style can also be seen in other ciders from the US and Europe. In the Hudson Valley area, there are examples of many different styles of craft cider. One of the oldest and most established brands is Hudson Valley Farmhouse cider, where cider maker Elizabeth Ryan has owned her own orchard since the 1990’s. Her style has traditional English influences with a fresh, new world style. Look for her products on tap and in bottle at restaurants and in higher end bottle shops. Orchard Hill, the hard cider division of the 105 year-old family owned and operated Soons Farm in New Hampton, NY, boasts clean, dry, European-inspired, food-friendly styles of cider made from NY apples. 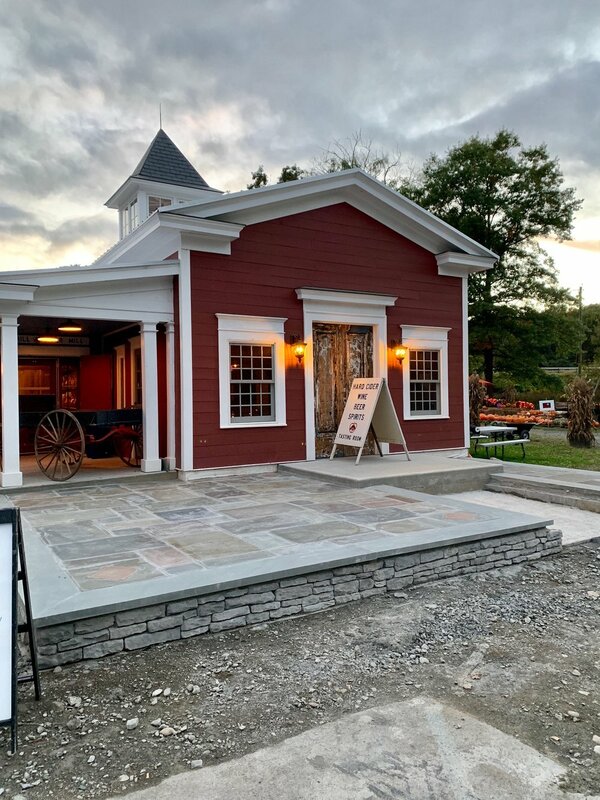 Their newly expanded tasting room, dubbed the “Empire Room” was fashioned from an open pole barn and the woodworking is inspired by Normandy, France styled tasting rooms. The Empire Room houses public music events most weekends with light food and New York State craft cocktails made by an in-house mixologist. Their products are available in bottle, can and on tap at the tasting room, restaurants and retail wine stores. King’s Highway in Millertown, NY has a fruit forward, approachable style with zero carbs and zero residual sugar. The result is an award-winning line of products that are great for social events or food, that is dry and refreshing, with options in eye-catching cans, bottles and on tap. With flavors like Royal Blueberry, Whip Appeal, a guava cider, and Ginger Snap, a roasted ginger and lemongrass style, there is a little something for almost everyone. Treasury Cider in East Fishkill is another orchard-to-bottle cidery at third-generation owned and operated Fishkill Farms, with some apple trees that are over 50 years old. The labels on their 750ml bottles include a plethora of information, including apple varieties and sweetness index. They have an on-site tasting room, open from June-October. Pitchfork, a small cider house out of Poughkeepsie, has small batch, handcrafted cider available in 12 oz and 22 oz glass packages. It is unfiltered, so you will see sediment in the bottom of the bottle, and made from apples sourced from the Hudson Valley area. You can find them at liquor stores, and at farmers markets and festivals around the area, often being sampled by the cider maker himself. Brotherhood Winery in Washingtonville, makes the True Believer and Rebel Reserve line of ciders, available at liquor stores. True Believer is a semi-sweet style cider with a ton of fruit on the front that finishes soft and easy with a clean acidity. Rebel Reserve is a nice contrast, with a dry style that is barrel aged. Pomme Sunday, a new cider house this year, came to the market with and English-inspired product with no carbonation. This “still” cider is made in Catskill with a blend of only 2 apples, both sourced from New York State. The lack of carbonation and dry finish makes it feel like a fine white wine, allowing the complexity to shine through. Try this one with food in place of pinot grigio. Metal House another exciting cider house in the area, uses abandoned orchards in the Hudson Valley as a source for their fruit, which have not been sprayed with fertilizers, pesticides, or herbicides. Using champagne yeast and influenced by the owner’s family’s background in wine making, this product has beautiful, small, dense bubbles and is dry and refreshing. Limited and vintaged, this is a must-try for Hudson Valley cider enthusiasts! With so many styles of hard cider in the area, there are many options out there for those who want to explore the category outside of the common, commercial types. A knowledgeable wine shop with a strong selection is a great place to start. Once you find the styles you enjoy, a trip to the tasting room and speaking with a local cider producer is a great step.